Parts logistics made simple. Order and warehouse your parts with Simcona. Best in class manufacturers ready to meet your demands. As a trusted Value Add Solutions provider, we are proud to present our customers with total package solutions as well as piece part products. Our dedicated team of industry professionals strives to grow customer business trust and prepare them with the necessary tools to succeed. Simcona is honored to sustain strong relationships with over 100 leading manufacturers in the industry. We have access to thousands of products through our close partnerships, and have the ability to store product in our 50,000 square foot climate-controlled warehouse. Let the team at Simcona Electronics Corporation help you with your needs today. 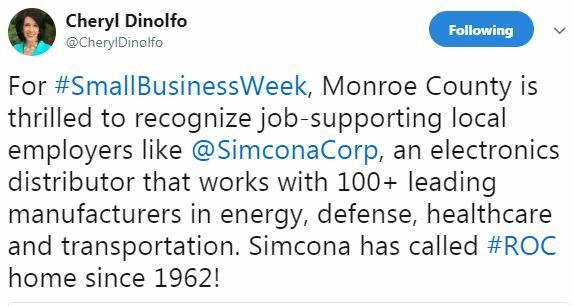 Simcona Electronics Corporation has been an employer in the Monroe County area since 1962. We are honored to be a Small Business Week Spotlight thanks to Monroe County Executive, Cheryl Dinolfo!